ACCESSIBLE PARKING/DROP-OFF: Goodyear Ballpark was built to comply with the rules and regulations of the Americans with Disabilities Act. Seating, restrooms, concession stands and drinking fountains have all been designed to provide comfortable access to all. Any persons with disabilities needing a wheelchair may request assistance at the Guest Services booth in the Home Plate Plaza. Accessible parking is available in the lot across from the Third Base Entrance (Lot 3). Drop off is also available at the Third Base Entrance. AISLE POLICY: As a courtesy to others, guests are asked to refrain from walking or standing in aisles during play. ALCOHOL SALES: Goodyear Ballpark offers a variety of alcoholic beverages for sale. Guests must be 21 to purchase any alcoholic beverages. Alcohol sales will end at the bottom of the seventh inning. All alcohol must remain inside the ballpark. ANIMALS: Guests are not permitted to bring animals into Goodyear Ballpark unless they are certified service animals for persons with disabilities. Animals are permitted on the practice fields, but must be on a leash. ATM MACHINES: ATMs are located in the ballpark at Home Plate Plaza near guest services and on First and Third Base concourses. AUTOGRAPHS: During a ballpark game, autographs are available from players choosing to sign until the start of the national anthem. At that time, ushers will inform guests to return to their assigned seats. Autographs are also available from players choosing to sign during team practices. Practices are normally held during the morning hours at the Development Complex practice fields. Promotional autograph days will be listed on the Web site. AUTOMOBILE ASSISTANCE: Guests experiencing minor automotive problems (jumpstart, flat tire, etc.) while at Goodyear Ballpark should proceed to Guest Services for assistance. BABY STROLLERS: Baby strollers are to be folded and positioned under the railings behind accessible seating sections. Strollers must not impede or interfere with any guest walking in the seating bowl. BAGS AND PURSES: Guests are welcome to bring small bags and purses into the ballpark, as long as their dimensions do not exceed the 16" x 16" x 8" Major League Baseball size requirement. All bags are subject to search upon entry to the ballpark. BANNERS AND SIGNS: Banners and signs are welcome as long as they are not commercial, political, derogatory or obscene in nature and do not interfere with the game and/or block the view of any other guest. BOTTLED WATER: One factory-sealed plastic water bottle (non-carbonated and colorless water only) not exceeding one liter in size per guest may be brought into the ballpark. CAMERAS & VIDEO EQUIPMENT: Non-commercial cameras and video recording devices may be brought into the ballpark. Guests should not obstruct the views of others while using this equipment and should refrain from using any camera support equipment such as tripods. CHILD LOCATOR WRISTBANDS: our young fans are encouraged to stop by Guest Services to pick up a Child Locator Wristband, which will include the child's ticket location and/or a contact phone number in case the child gets separated from his/her party. CLUB SEATING: Sections 106A, 106B and 107A are located under a canopy and are entirely shaded. Club seats are wider, padded and offer in-seat wait service. CODE OF CONDUCT: No one is allowed on the ballpark field at any time without proper credentials. If anyone enters onto the field without proper credentials, he/she will be immediately ejected from the ballpark without a refund. The same ejection rule applies for the practice fields. Anyone using obscene or abusive language or causing any type of discomfort to the guests around them will be asked by Goodyear Ballpark personnel to cease this conduct. If the offensive conduct persists, those involved will be subject to ejection from the ballpark without a refund. COMMENT CARDS: Comment cards are available at Guest Services located in the Home Plate Plaza. CONCEALED WEAPONS: In accordance with A.R.S. § 13-3102 and A.R.S. § 4-229, firearms and deadly weapons are prohibited from entering the Ballpark. All guests entering the facility are subject to metal detection entry screening. CONCESSIONS: Professional Sports Catering is the contracted concessionaire at Goodyear Ballpark. There are four signature fixed concessions stands throughout the ballpark as well as 24 portable sales units with a variety of food and beverage offerings. Portable stands include items such as nachos, frozen treats, margaritas, specialty burgers, ice cream, cotton candy and kettle corn. COOLERS: Soft-sided coolers not exceeding 16" x 16" x 8" may be brought into the ballpark and are subject to search. Hard-sided coolers are prohibited. CORPORATE SPONSORSHIPS: For sponsorship and advertising opportunities at Goodyear Ballpark, please call (623) 882-3120.
CREDIT CARDS: All major credit cards are accepted at the Ticket Office, Team Shops and concession stands. DIAPER CHANGING STATIONS: Diaper changing stations are available in all public and family restrooms in Goodyear Ballpark. DRINKING FOUNTAINS: Drinking fountains may be found near each of the restrooms. ELEVATORS: Goodyear Ballpark is equipped with two elevators. The elevator in the Home Plate Tower provides access to Suite and Terrace level ticket holders, team/ballpark staff and media personnel only. The other elevator is located at the Right Field Pavilion, providing access to the Premium Field Box seating area on the first-base side. Located at the intersection of Ballpark and Festival ways, just east of Estrella Parkway. Located on Festival Way, between Estrella Parkway and Wood Boulevard. Located on Ballpark Way, between Goodyear Boulevard and Festival Way. Located on Goodyear Boulevard, just east of Estrella Parkway. FIRST AID: The first aid station is located inside the Home Plate Entrance across from the Team Shop. FOUL BALLS: Guests are welcome to keep any foul ball hit into the stands. At no time should a foul ball be thrown back on the playing field. Violators will be subject to ejection. GATES OPEN: Ballpark gates normally open 90 minutes prior to game time. Practice field gates normally open at 9 a.m. daily. GROUP TICKETS: Discounts are available for groups purchasing 20 or more tickets, subject to availability. Group tickets are available in the Suites, Terrace, Right Field Pavilion, Party Patio, Club Seating, Infield Box, Outfield Box, Outfield Reserved and Berm seating areas. Please contact the Ticket Office for more information at (623) 882-3130. GUEST SERVICES: Guests with questions, comments and concerns may seek assistance at the Guest Services booth, located on the concourse behind home plate. Guest Services is open from the time gates open until the crowd departs. KIDS ZONE: Located on the First Base concourse, the Kids Zone includes interactive inflatable activities and a children-sized Wiffle Ball field. INJURY DISCLAIMER: The holder of a ticket voluntarily assumes all risk and danger of personal injury and all hazards arising from or related in any way to the event for which it is issued, whether occurring prior to, during, or after the event. LOST AND FOUND: Lost and found inquiries can be directed to Guest Services or by calling (623) 882-3120. LOST CHILDREN OR COMPANIONS: In the event of a lost child or companion, please proceed to Guest Services for assistance. NATIONAL ANTHEM PERFORMERS: Those interested in performing the national anthem should submit their information and audition through goodyearbp.com. NON-GAME DAY EVENTS: Goodyear Ballpark is available for community, private and corporate events such as team buildings, workshops, concerts, arts and crafts festivals, tournaments and more. For more information and rental pricing, please call (623) 882-3120. NURSING MOTHERS: Mothers who need nursing accommodations may use the family restrooms located on either the first or third base side of the concourse. OFFICIAL GAME: A game is considered official after 4 1/2 innings have been completed. PAGING: Requests for paging are only honored in the event of an extreme emergency. PAY PHONES: There are no pay phones in the ballpark. Guests needing to use a telephone may proceed to Guest Services. PRESS BOX: The press box is located on Level 2. This area is restricted to members of the media, team and working staff, and those who have proper ballpark credentials. PROGRAMS: Official souvenir programs are available at all Goodyear Ballpark games and may be purchased throughout the concourse and in the team shops. RE-ENTRY: Those guests who need to leave the ballpark, but plan to re-enter, must have their hand stamped in order to regain entrance back into the ballpark. Re-entry access is available at all gates. R.V. PARKING: R.V. 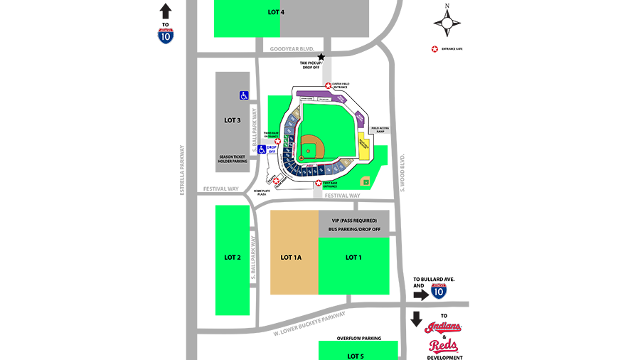 parking is available in overflow parking on Wood Boulevard across from the Cleveland Indians Development Complex. Overnight parking is prohibited. SAFE SITTING ZONES: Guests attending a game who would like to reduce their risk of being struck by a flying object from the field have the opportunity to change their seating assignment, based on availability. However, no seat in the ballpark can be guaranteed to be completely safe from such flying objects. SCOREBOARD MESSAGES: Goodyear Ballpark offers the opportunity to relay anniversary or birthday messages on the scoreboard. For a $25 fee, a message will be shown during the sixth inning. Inquiries should be directed to Guest Services. Requests may be filled out until the 3rd inning. SMOKING POLICY: In accordance with the laws of Arizona, fans are not permitted to smoke or use tobacco products anywhere on Goodyear Ballpark property. Electronic cigarettes (E-cigarettes), vapor cigarettes or devices that mimic smoking are also prohibited. Goodyear Ballpark is a non-smoking facility. Fans may use the re-entry available at the Center Field, Third Base or First Base Gates to smoke outside the ballpark. SUITES: Four suites are available for rental on a per-game or per-season basis. Each suite holds 15 people, and two to four suites may be combined to accommodate larger groups. Suite rental price includes food. For more information or to rent a suite, please call (623) 882-3130. TAILGATING: Tailgating in ballpark parking lots is restricted to guests' own parking spaces in front of or behind their vehicles. Gas grills only. TEAM SHOPS: The main Team Shop is located at the Home Plate Entrance, and three smaller locations are located at the First Base, Third Base and Outfield Entrances. TERRACE LEVEL: Located on the third floor behind home plate, this exclusive area accommodates up to 90 people and tickets include game entry, food and fountain beverages, access to a cash bar and private restroom facilities. The Terrace offers some of the best views of the ballpark. UMBRELLAS: Guests may bring personal small umbrellas not exceeding 36 inches in diameter into the Goodyear Ballpark as long as they do not interfere with other guests' view or enjoyment of the game. Umbrellas larger than 36" are prohibited. WHEELCHAIRS: Guests needing wheelchair assistance may be taken to and from their seats. Wheelchairs are available at each of the entrance gates.